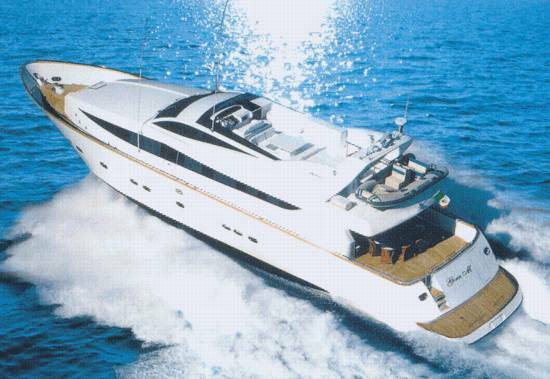 GINA M is amongst the most luxurious charter yachts in the Mediterranean, designed by Fulvio de Simoni. Its unique design, shape and decor, together with her ability to cruise in total comfort, places GINA M, on top of the list. 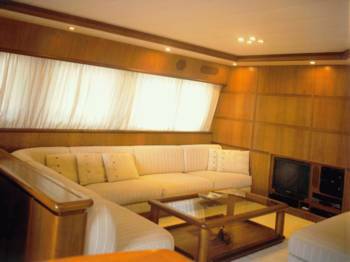 Well built, appropriately planned, designed with classical elegance, featuring large spaces, she can accomodate comfortably 8 guests with an expert crew fo 4 to cater to their needs. 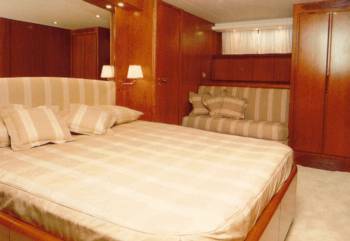 Satine wood panelling, builit-in furniture, custom made carpets, fine handmade fabrics, together with superb service and taste, will lead your cruise in perfection. Four luxury cabins, two doubles and two twins, all with en suite bathrooms and specially desinged for comfort and sweet dreams. 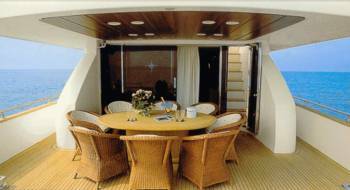 Sun drenched and sun shaded areas offer various possibilities for dining and leisure. 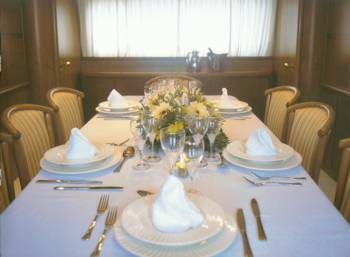 ACCOMMODATION : For 9 guests in four cabins; one master, one VIP, one twin and one twin with extra pullman birth, all with en suite facilities. Crew of 4 in separate quarters. 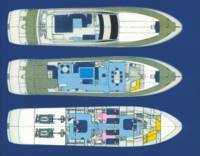 EQUIPMENT : Fully air-conditioned, SAT Com, GSM phone, Radar, Plotter, Autopilot, PC, Depth finder. 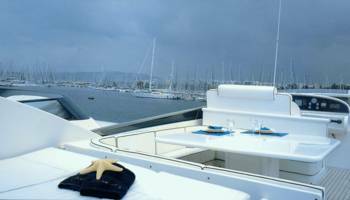 RECREATION : Sat TV, Video, DVD, Dolby surround CD stero system in salon, TV/Video, audio in master, TV/Sudio in VIP, Inflatabel Nouvourania 4.50 m with 78 HP Yamaha, Water ski, Jet ski.